Tool Center Point Management eliminates the need to account for the machining center’s centerlines of rotation. Instead, you simply program from part zero. Tool Center Point Management allows you to position the part anywhere on the table. Transform Plane simplifies programming for 5-sided machining on a 5-axis machine by automatically determining the additional part zero locations. You only need to define part zero one time, and Transform Plane manages all of the other part zero locations. It basically changes programming on a 5-axis mill back to 2.5D programming that you would do on a 3-axis mill. You don’t need to worry about the tilting or rotating. 3-D Tool Compensation eliminates the need to repost the program in order to adjust the tool diameter because of tool wear or tool substitution. Compensates for tool wear, eliminates idle time caused by tool breakage, and provides flexibility and freedom in tool selection. Shortest Angular Traverse takes the fastest path to reach the target position. For example, if you position the rotary axis at 350 degrees and then command the next position to 20 degrees, the distance will be 30 degrees when Shortest Angular Traverse is activated versus 330 degrees when it is deactivated. Tool Path Linearization eliminates gouging of the workpiece and removes the looped line segments on the part that are formed from the XYZBC or AC moves that a CAM system uses. Improved surface finish quality and smaller NC programs. Tool Vector Input allows the control to compute machine angles and positions, and calculates the angle the tool is going to tilt from the contact point of the surface. Benefits: Scheduling flexibility (the program can run on another 5-axis machine with a different axis configuration) and simplified post processor. Automatic Safe Repositioning (ASR) tells the machine to retract along the vector and override the out-of-limits protocol. No stoppage. No error message. The software is smart enough to retract, move to Z0 along the X-limit, re-orient the tool, move to retract plane, move above the plunge point, and plunge to the target along the tool vector. ​Universal Rotary allows a part program to be used interchangeably on both types of Hurco 5-axis machining centers even though they have different configurations. You simply program how the tool rotates into position on the part, and the control instructs the machine how to orient the axis to cut the feature. The tool retracts along the tool tilt angle and the tool vector angle becomes the Z axis. The Tool Vector Canned Cycles make it easier to program in CAM. You can drill or tap along angles without Transform Plane. Rotary Axes Centerline Probing automatically measures the centerlines of the rotary axes. alignment issues, and it is easy to setup and execute. Many shop owners think they don’t have parts that warrant the investment in a 5-axis CNC machining center or they think they would have to buy a CAM system. Even if you don’t have simultaneous 5-axis work, you’ll increase the profitability of the parts you are cutting on your 3-axis machines when you use 5-sided machining on a Hurco 5-axis machining center—and you won’t need to buy a CAM system! Why Hurco for 5-sided programming? The Hurco control simplifies programming so you can program right at the control using our conversational programming. We have numerous customers who only had 3-axis experience and they were running parts on their new 5-axis Hurco before the training sessions even started. 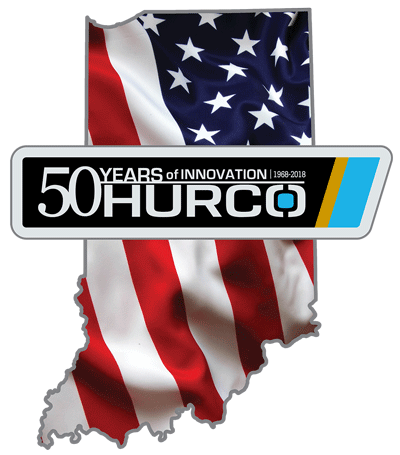 When we say, “Nobody gets you from print to part faster than Hurco,” we mean it. If your shop is already doing full 5-axis (simultaneous 5-axis), our control has the processing power and memory to handle your NC programs. Equally important, we keep the control up-to-date with CAM packages so you don’t have to worry about compatibility. 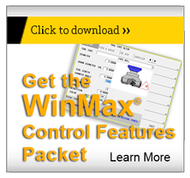 But you’ll also find 5-axis features in our control that actually improve NC programs. For example, Tool Path Linearization significantly improves surface finish quality because it removes the looping motion that creates tool marks on the part caused by CAM interpolation—and it also reduces the size of NC programs. To learn more about the 5-axis features of the Hurco control, simply click on a picture in the carousel above and the text appears in the box to the right. Pay special attention to features denoted as Hurco Exclusive or 5-Star—these ratings were assigned by our Applications Engineers, based on their industry/machining expertise and customer input.